I guess the main problem will be the pressure (10bar) at 100m. A camera is necressary and source of light. I'm considering using 2 cameras for stereovision. It is possible to see a real 3D pictures using special glasses. I plan to buy simple a CCD camera and 2x50W/12V halogen lamps. A compass, temperature and pressure sensor. Maybe a moisure sensor to warn when the robot leaks. Minimalistic design using only 3 electric engines. Simple open–close manipulator. Similar to one that Seabotix use or at Homebuilt rov's (Misc. Projects). ATMEL ATmega8 processor inside the robot, controlled via an RS-485 from a laptop + joystick (later control console). 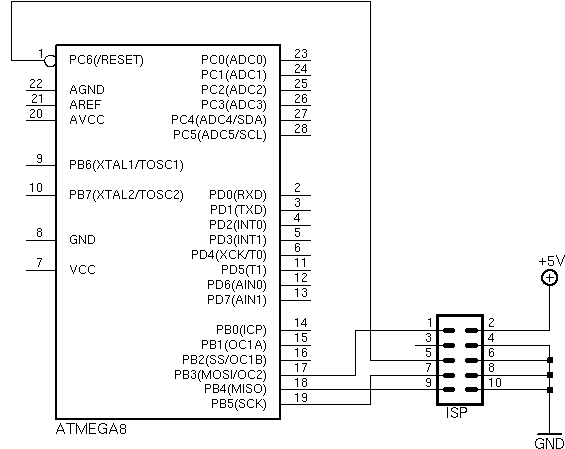 I will focus on ATMega8 micro controller, but the description is valid for other AVR micro controllers as well. EEPROM – 512 B, endurance 100,000 write/erase cycles. As you can see the amounts are suitable for most, even sophisticated purposes. Note, that one instruction occupies 16 bits (2 bytes), in 8kB of memory you can fit 4k instructions. The micro controller, depending on it's version, can be clocked from 0 MHz to 16 MHz (ATMega8) or 8 MHz (ATMega8L). Operating voltages: 4.5–5.5V and 2.7–5.5V in case of ATMega8L. Power consumption at 4 MHz, 3V, 25°C: 3.6mA (active mode), 1.0mA (idle), 0.5µA (power-down). ISP is abbreviation of In-System Programmable, ATMega has additional feature – In-System Self-Programmable it simply means that the FLASH (and EEPROM) memory can be programmed without desoldering or ejecting the chip from the socket. During design you must remember to add 10 pins connector and make proper connection with ATMega8. If the AVR is not set for use with internal RC oscillator you have to attach some clock source (the one for which the microcontroller if configured for - for example crystal oscillator). 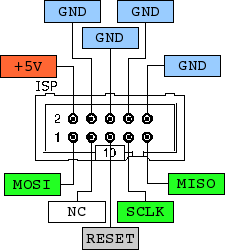 Clock source can be configured using fuse bits, which are set up during the MCU programming. There's also other possibility - the micro controller can program itself using (programmed earlier) boot code – code can be downloaded ex. through serial port or two wire interface (I2C). Below is a closer look on the connector (sometimes known as IDC10 or ML10), it's stk200 starter kit compatible. You can use any other connector, just remember about all signal wires (RESET, CLK and so on) and the plug which must be the same as in your programmer. There are number of plug "standards" which can be found on Internet, I think that stk200 is the best choice because it's the same as in Atmel starter kit and many programmers support it. The third pin is described as NC (not connected), but you can connect a LED (on the AVR side) to indicate programming process. The ISP interface can coexist with devices attached to the same MCU port lines, as long as they're used as outputs, not inputs. Imagine, if an external device pulls down one of the signals, the ISP interface won't work. You can also make use of bootloader code, which you must write on your own, or use a precompiled one. In that case you don't need to have the ISP interface on your PCB, but remember - the MCU must have some external interface (serial, I2C) to download the code, additionaly you need to program the bootloader code first. Good: save some space on PCB, free up some port pins, no need to have a direct access to the board - MCU firmware updates can be made externally; bad: can be slower, bootloader takes up some FLASH space, you must write a bootloader. If you use SMD parts the programmer will fit in DB-25 casing. To program the device connect the programmer with your PCB one to one cable. To program you need some tools, read below. It's always hard to start, if you get familiar with the AVR architecture everything be easy. The "bad" thing about AVRs is that, on the beginning, it's hard to learn all the quirks with different issues (like programming) – the CPU is highly configurable, it makes it more flexible but harder to learn. That's my opinion of course. Below are some links where you can find tutorials and where you can ask for help. The knowledge base for you is AVR data sheet, it's a bit technical, but has a lot of examples (in assembler and C) how to use AVR peripherals. You can find data sheets on Atmel site. avr libc documentation – explains how to use libc library, also gives guidelines how to use other tools (like avrdude). It explains a lot of issues related to AVR programming. There is also one more possibility. If you do not like C or assembler, you can use BASIC. There is a commercial product BASCOM – perfect for small projects. Has many high level functions and is very easy to use. You can compile up to 2kb of code for free. If you have a problem don't hesitate to ask. Most cameras have a standard composite video output signal (described as 1Vpp 75 Ohm). You can directly connect camera output to the TV or a video recorder. This is the best choice, cheap and widely used. Because it uses an analog signal, you need an extra equipment to connect it to a computer, but in most cases it is not necessary – you can use standard video monitor. Video to USB converter costs about 50€ , TV or video PCI cards are even cheaper. To connect a camera to analog monitor, you need a 75 Ohm cable. But if the length of cable is less than 100m you can use an ordinary cable (twisted wires). For long cables you need a converter (very simple to build). There are other solutions, like firewire or even RS-232. I see no any reason to use firewire, maybe if you want to use video camera with firewire input as monitor. I expect only problems when using firewire, especially with maximum length of the connection cable. One (and the only) good thing about an RS-232 camera is that you can plug it directly to the computer. The very bad is that it can provide only 3 frames per second! This is right solution if you like to watch static images. Many cameras are powered by 12V, some 5V. Consumer video cameras (VHS, DV, Hi8) needs the same voltage as its batteries, e.g. 7.2V. If your robot is powered by 12V try to choose 12V camera. For other voltages you need voltage converter. Resolution of CCTV cameras is defined by number of lines (TVL). More lines means more details on the screen. Typical values are from 320 to 470 lines. There are cameras with 600 lines but use it only if you have unlimited budget. Apereture size. Greater number – you need more light. F1.2 is very good, F2.0 average. Field of view. Depends on focal length. Greater focal length – narrowed angle of view. There are two types of sensors: CCD and CMOS. All cheap cameras have CMOS sensor. More expensive and consumer video cameras have CCD sensor. Most important parameter of sensor is sensitivity. This is minimum amount of light that camera needs to proper work. Less number means better parameter. 0.1lux – very good, 1lux – average, 3lux – rather bad. Note that some cameras have Sensitivity 0lux. It means they can work in infrared range and thus you need an extra infrared lamp. Black and white sensors have usually better sensitivity then color ones. Sensitivity depends on apereture size of lens. Its value is always given with apereture size, like 0.3lux/F1.2. You can improve sensitivity using lens with better parameters. I bought an old second hand consumer camera with intention to adapt it as a primary vision for the robot. But final decision is not taken yet. Size: 250×190×50mm Good lens x14 zoom, auto and manual focus. Can show date, time on screen. Ability to record video. Easy to interface with microcontroller. Cost about 40€ The size and weight. Power consumption. Size: 32×32×16mm Cheap (40-50€). Small and light. Low power consumption (200mA/12V). The camera can be installed in very small housings. No auto focus and zoom. No remote manual focus. Low quality lens. CCTV camera (without lens on the picture). Size: 50×50×110mm Various types of lens available. Auto focus. Small size. Low power consumption (200mA/12V). Price (75€ and more). Good lens cost too much. Hard to control focus/zoom by microcontroller. Navigation in the underwater environment is not as easy as on the ground. You have only images from a camera, no sun, no characteristic points, water is not as clear as the air. 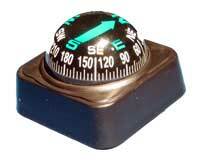 Expensive commercial vehicles uses sonar, but for homebuilt ROV an old fashioned compass is enough. It is worth to mention that you must be careful installing a compass in the robot. It can be affected by electronic and electric engines. The idea is simple, you must attach classic compass to the robot in a way you can see it in the camera. If your compass is not waterproof or can not handle high pressure you can use little trick. Put the compass into camera housing and attach a mirror in the front of camera (not in housing). You can see the compass in the mirror using camera. Use car compass (not "flat") with a ball. Similar to the one shown on the left. It costs about 3€. For practical use, look at Subz NZ page. Digital compass can be easily connected to micro controller. Very popular design use Dinsmore 1490 chip. Two combined units provides only 8 headings (N, NE, E, SE, S, SW, W, and NW). For more details look at Arrick Roboticks. For more links look at Brooke's Home Page. If you do not want to build a digital compass from scratch, you can buy a compass module. It is PCB with one of the above chips. Devantech CMPS03 based on KMZ51, 40€. Honeywell modules RS-232/RS-485 from 75€.